Five raid assessments carried out at RAF Spilsby. Detail of problems encountered in each operation. 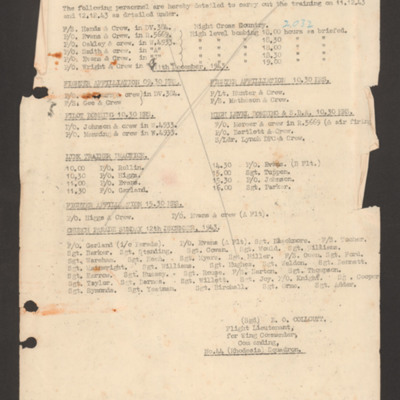 Final sheet is an extract from Operations Record Book by three different Lancasters. Frederick Ball grew up in Yorkshire and trained as a motor mechanic, before he joined the RAF in 1939. He completed two tours with 44 and 49 Squadrons, as a wireless operator flying from RAF Waddington and RAF Scampton. Details night flying training for six crews on 11 December. Details five crews for day training fighter affiliation and bombing for 12 December. Lists eight crews for link training. 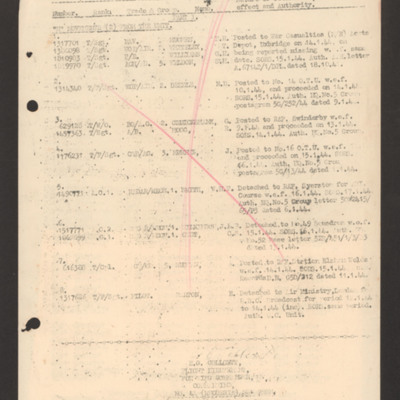 Details personnel for church parade on 12 December 1943. Lists crews and aircraft for operations. Fourth member of each crew is underlined. Includes two standby crews, timings and duty personnel. 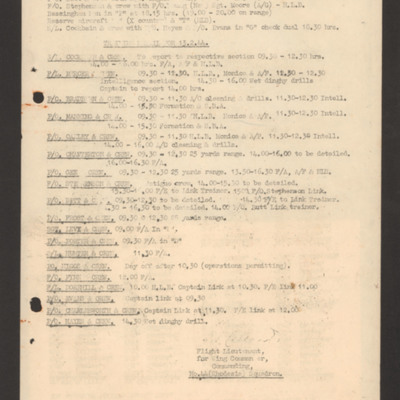 Lists crews and aircraft for operations on night 19/20 March 1944. The fourth member of each crew is underlined, some are ticked and the two in standby crews are annotated with 'X'. Includes briefing times and duty personnel. Lists crews and aircraft for operations. Fourth member of each crew is ticked. Includes two standby crews and duty personnel. 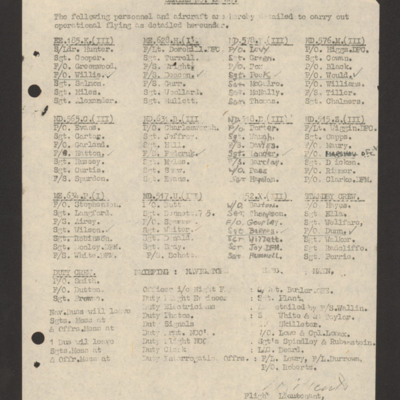 Lists crews and aircraft for operations on night 22/23 March 1944. The fourth member of each crew is underlined and ticked. Includes one standby crew with aircraft 'T' annotated alongside. Includes timings and duty personnel. 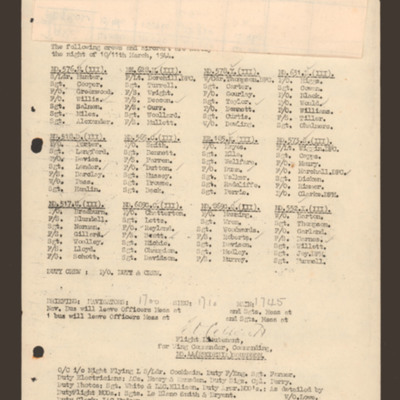 Lists crews and aircraft for operations on night 24/25 March 1944. Fourth member of each crew is underlined in red. Two crews flying with second pilot and one with second navigator. Includes duty personnel.